It just feels wrong, this notion that it's possible to powder coat over wet paint, right? The paint is in a soluble state, after all, and it'll likely blister when it enters the oven. Therefore, at least initially, it seems like this isn't a viable option. We'll dig deeper, though, because there this question deserves an answer. Some customers do paint over powder coated parts, but we consider this an unwarranted move, especially when there are already countless finishing options available from today's powder coating manufacturers. Maybe the user-nominated paint uses a discontinued colour, a shade that evokes memories? Otherwise, we still believe the powder finish should stand on its own merits. Before a workpiece enters an electrostatic bay, it passes through a preprocessing room. 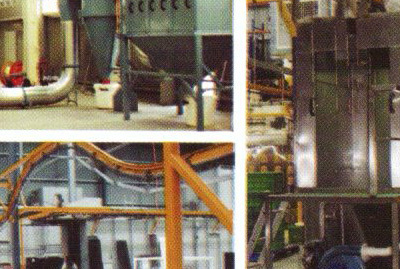 This part of the process strips the part of contaminants. We're talking about a very aggressive procedure, one that uses caustic chemicals and mechanical forces. We mention this beginning stage as a means of establishing context. Nothing is left on the cleaned part, absolutely nothing. A wet paint covering, although uniform in appearance from a distance, completely contradicts this parts-scouring methodology. Imagine the wet stuff, its malleable liquid form. The powder would likely still adhere to the paint, but it would never establish a homogenized membrane around the part. Indeed, the powder and the paint mediums will mix. This latter event results in an ugly bleeding effect. 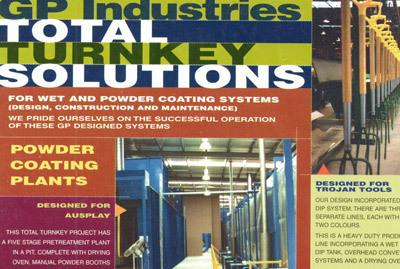 The secret ingredient in the powder coating process is dry powder. The tiny pellets contain special resins. They're the seeds of the process. Designed to flow when they're exposed to intense temperatures, they create colour, texture, and a shell-like finish. Furthermore, the liquidized powder bonds strongly with the underlying part. Picture that dry powder and the wet paint undercoating when the part enters the oven. The paint begins to bubble and blister. The powder, also in a state of flux, refuses to adhere to the metal part because of the scalded paint, so an impenetrable membrane is impossible to achieve. 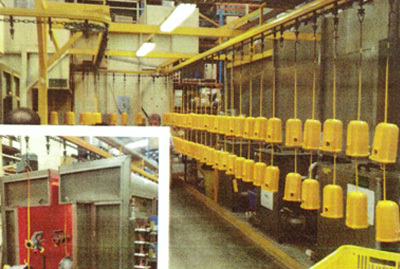 The most important part of the powder coating process is what takes place before the electrostatic work. It's this prep work that scours the part clean. A wet paint base negates this preparation period. Worse yet, the liquidized emulsion undermines powder coating technology by corrupting the finish. That's what happens when wet paint crosses paths with an industrial oven, a heat source that throws out 204°C of curing heat.